Canaima National Park is located in the south-east of Venezuela in Bolívar State close to the borders with Brazil and Guyana. The park protects the north-western section of the Guayana Shield, an ancient geological formation shared with Brazil, the Guianas and Colombia. The park was established in 1962 with an area of 10,000km2, but its size was increased to 30,000km2 in 1975 in order to safeguard the watershed functions of its river basins. At that time it became the world's largest national park, its area being equivalent to that of Belgium in Europe, or larger than the State of Maryland. In recognition of its extraordinary scenery and geological and biological values, the park was conceded World Heritage Status in 1994, forming one of a select list of 126 natural and natural-cultural World Heritage Sites worldwide. Canaima actually fulfilled all four of UNESCO's criteria for qualification as a World Heritage property. Ironically, the name of the park, which derives from the novel "Canaima" by Venezuelan author Rómulo Gallegos, means "spirit of evil" in the language of the Pemón, local inhabitants of the park. The best-known feature of Canaima National Park are its characteristic flat-topped mountain formations known as tepuis from the local indigenous name. These mountains were popularised in several novels from the early part of this century, many of them inspired by the 19th Century British botanist Everard Im Turn who lectured throughout Europe on his return. The most widely recognised of these novels is The Lost World by Sir Arthur Conan Doyle, author of the Sherlock Holmes novels, which describes the ascent of a South American plateau inhabited by prehistoric plants and dinosaurs. The geological history of the area is only superficially understood. There are three main geological formations. The oldest is an underlying igneous-metamorphic basement formed some 1.2-3.6 billion years ago whilst South America was joined to Africa as the supercontinent Gondwanaland. Between 1.6 and 1 billion years ago, this was overlain with a sedimentary cover. The first of these formations is too deeply buried to be visible within the park, but second (known as the Roraima Group) forms the basis of the area's extraordinary topography (Huber 1995). It consists of quartzite and sandstone strata which were probably laid down in shallow seas or large inland lakes (Briceño et al. 1990) during the Pre-Cambrian period. Lastly, during Palaeozoic and Mesozoic times magma repeatedly penetrated the existing sediments forming intrusive rocks which are typically diabases, and to a lesser extent granites. The tepui formations, not unlike those found in the deserts of northern Arizona, came into being by a process of erosion of the surrounding lands over millions of years. The tepuis are sandstone massifs, and it is thought that what are today mountains once formed harder or less faulted strata which were more resistant to erosion. There is an impressive array of different soil types. The low mineral content of the parent rocks of the Guayana Shield, the high rates of weathering that occur in tropical climates and the age of the sediments has produced soils which are generally acid and nutrient poor. Only where there are more basic igneous intrusions are the soils capable of supporting luxuriant forests or cultivation. The vegetation of the national park is quite strikingly divided between the mainly savanna-forest mosaic of the Eastern Sector of the park, known as the Gran Sabana, and evergreen forest in the west. It is still not clear what causes this difference and, in particular, how the savanna originated. Whilst some authors are inclined to believe the savanna to be a product of a rainfall shadow caused by the eastern tepuis, others consider the formation to be entirely anthropogenic, being a product of repeated burning by indigenous peoples. The truth undoubtedly lies in a combination of the two (Schubert and Huber 1989). The presence of 107 plant species found only in these savannas (Picón 1995), demonstrates that they have existed at least long enough to allow new species to form. The savannas are dominated by grasses, typically Trachypogon plumosus and Axonopus pruinosus, and fire-resistant sedges like Bulbostylis paradoxa which forms a small cushion on which it raises itself above the ground to avoid the worst of the savanna blazes. Stunted shrubs like Palicourea rigida are also found at low densities. The high meadows, on the other hand are composed of typically Guayanan herbs such as the broadleaved species of the genus Stegolepis, a member of the Rapataceae, a family found only in the Guayana Shield and with one genus in West Africa; members of the Xyridaceae and Eriocaulaceae are also typical. The shrublands are usually composed of shrubs and bushes up to two metres tall, most of which are hard-leaved (coriaceous) and pertaining to several genera including Bonnetia and Clusia. The evergreen montane forests are often humid and luxuriant and include tree species of the families Leguminosae, Lauraceae, Vochysiaceae, Myristicaceae, Rubiaceae, Burseraceae and Annonaceae. 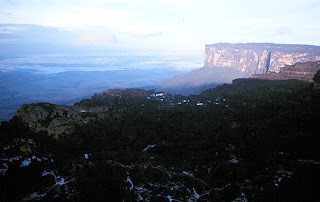 The tepui tops themselves are sometimes forested, with dwarf forests with members of theaceae (particularly Bonnetia roraimae), Araliaceae, Ericaceae, Compositae, Melastoataceae and Rubiaceae being prominent. In other cases, meadows prevail on the tops, typically with the composite Chimantea. One feature of these extremely nutrient poor environments is the presence of carnivorous plants, such as pitcher plants Heliamphora and sundews Drosera, which trap and digest insects as a supplement to mineral uptake through the roots. Pioneer vegetation is found on rocky outcrops with the bromeliads Brocchinia, Lindmania and Tillandsia being frequently observed (Schubert and Huber 1989). An important formation in the lower altitudes close to the rivers and shallow valley bottoms of the Karuai, Apanwao and Yuruaní basins, are the seasonally flooded palm savannas, or "morichales", which are dominated by the "moriche" palm Mauritia flexuosa. A species rich herb layer of grasses, sedges and other plants is found with in these formations (Huber 1995). Some 9400 species of higher plants have been recorded from the Venezuelan Guayana, of which 2322 are registered from the tepuis. This includes more than 700 species of orchid. The flora is highly endemic with 2 endemic families (Tepuianthaceae and Sacciofoliaceae), and 23 unique genera including Quelchia, Achnopogon and Chimantea of the Composite family, the Connelia bromeliads, the Tepuia heaths, the melastome Mallophyton, and Coryphothamnus of the bedstraw family. At the species level approximately 33% of the tepui species are endemic to the region with 99 species endemic to Chimantá alone (Huber 1995). Animal life is generally scarce all over the park and in all habitats, perhaps because of the extremely nutrient poor soils, which are unable to support a large biomass (Schubert and Huber 1990). In addition, there are relatively much fewer studies of animals than there are of plants, and thus our knowledge remains sketchy. Reptiles and amphibians are poorly known. Amongst the frogs there is an endemic genus Oreophrynella with several species on the summits of the tepuis. Some 536 bird species have been recorded from the park (Goodwin and Salas 1997). Of these, 42 are endemic to the tepui region. Examples include the Roraiman Nightjar Caprimulgus whitleyi, which is restricted to a few mountains in the south-east of the park, or the Tepui Tinamou Crypturellus ptaritepuiensis which is known from only two mountains within the park and has not been recorded for two decades. Some 118 species of mammal have been recorded, but a further 92 are expected to occur (Ochoa et al. 1993). One of the few endemics is a small rodent Podoxymys roraimae from the summit of Roraima. The park, being a large, relatively intact area, is important for the survival of tropical animals which are naturally found at very low densities and are elsewhere threatened with extincion. Thus, it is a refuge for large mammals such as puma Felis concolor, jaguar Panthera onca, tapir Tapirus terrestris, giant anteater Myrmecophaga tridactyla and giant armadillo Priodontes maximus. Likewise, avain top predators, like the legendary Harpy Eagle Harpia harpija, are also still to be found within the park. Much more research is still needed in order to discover and classify the full range of species found within the park, let alone to truly understand the complex interrelationships of these basic elements and therefore the ecology of the area. This reflection has prompted entomologist Paul Spangler to comment of the tepui flora and fauna that "many of the experts who will study and classify these materials are not yet born" (in George 1989).